"Natalie is in her first year at BCISD as well as her first year as a teacher all together. She has been a great addition to our Science department and 8th grade team." 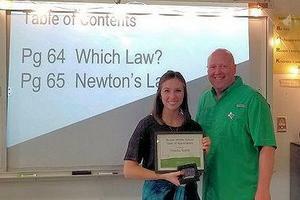 "From day one she has made an immediate impact here at BMS as an 8th grade Science teacher. The students really enjoy having her as a teacher as well. Anyone walking into Natalie’s class would think she has been doing this for years! We are blessed to have her here at BMS!"